If you are interested in donating your time and talents to help build your community, then you have come to the right place! 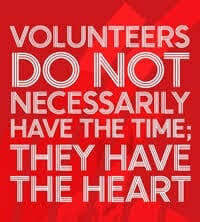 The Onalaska Alliance is 100% volunteer run. We can't do what we do without folks like you helping us every step of the way. We need help maintaining Carlisle Lake, running the Apple Harvest Festival, dying Easter eggs, and so much more. If you are interested in doing something for your community, please sign up for our community emails so we can notify you of the upcoming needs for volunteers, or you may contact us directly using this form. Sign up for email updates about our community, including special events, volunteer opportunities, and community meetings. ​Thanks for being a part of our community! Here's our volunteer Handbook. Print it, read it, and Volunteer! If you are under 18, we need you to sign a waiver. Print the waiver and bring it to the event that you are volunteering at.